My last two roadtrips centered on the southwest – all rock and desert, sun and heat, orange and yellow. I decided to change directions this time. I’d drive north along the California and Oregon coast and then cut over to the Columbia River Gorge near Portland. This trip would be more about water and trees, clouds and cool weather, blue and green. I left San Francisco early Monday morning and stopped first at Redwood National Park. 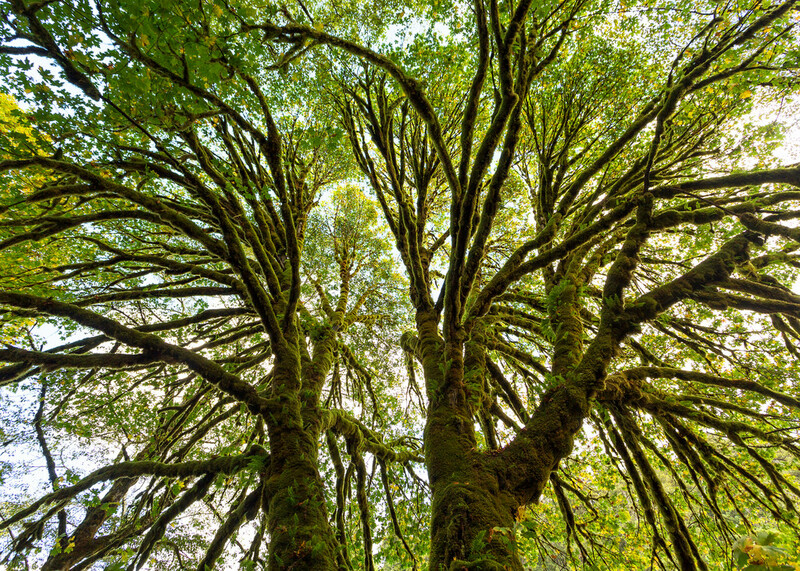 I’d never hiked up the Redwood Creek Trail and decided to check it out. There was only one other car in the parking lot at the trailhead, which made me happy, and the weather that afternoon was almost perfect – cool but not cold, a mix of clouds and sun. It had been a while since I’d walked through a redwood forest. 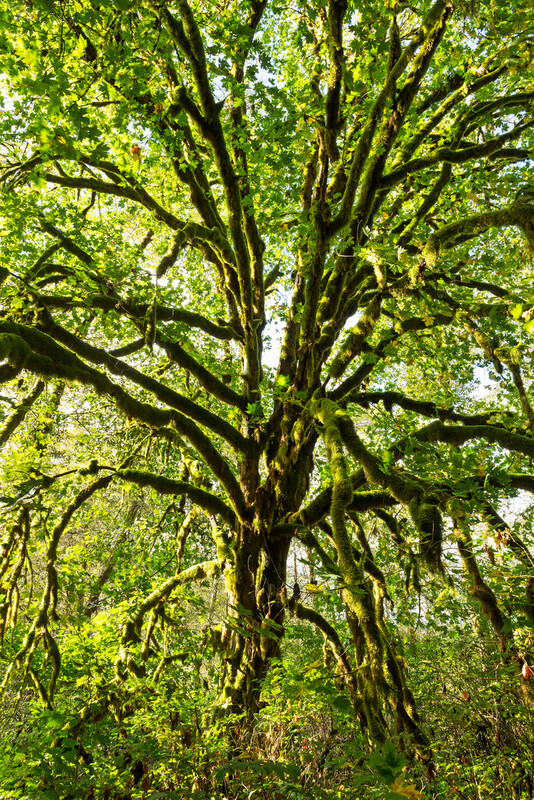 I’d forgotten how the vegetation engulfs you, how intensely green the backlit leaves glow when the sun comes out. My neck began to hurt from staring up so much. I eventually encountered the person who must have belonged to the car in the parking lot, a thin man in his 50s with a distant, dreamy look on his face. “Hello,” I said as we passed on the trail. He showed no acknowledgement of my presence and said nothing. Ha! I decided I’d pay at least $20 to hear his life story. 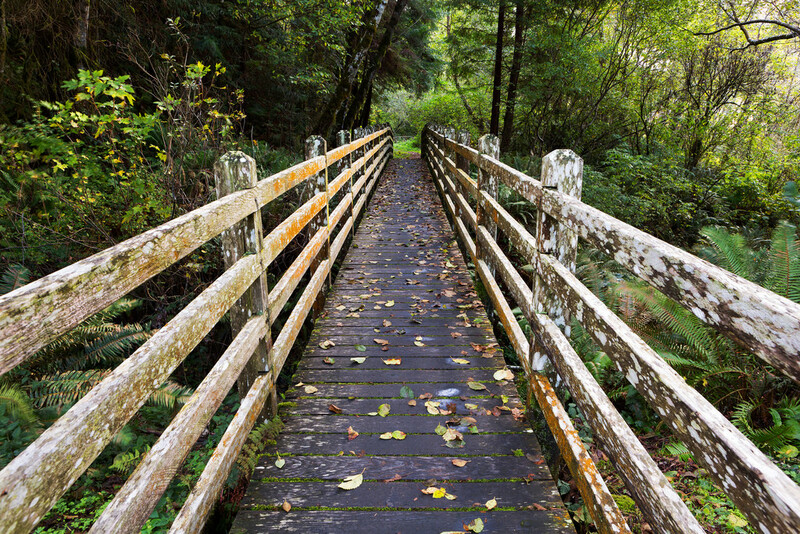 After a while the trail crossed Redwood Creek, but the bridge had been taken down for the winter. The water level was so low I just took off my shoes and waded across. I had the rest of the trail entirely to myself and enjoyed every moment of it. The next day I continued up the coast into Oregon. 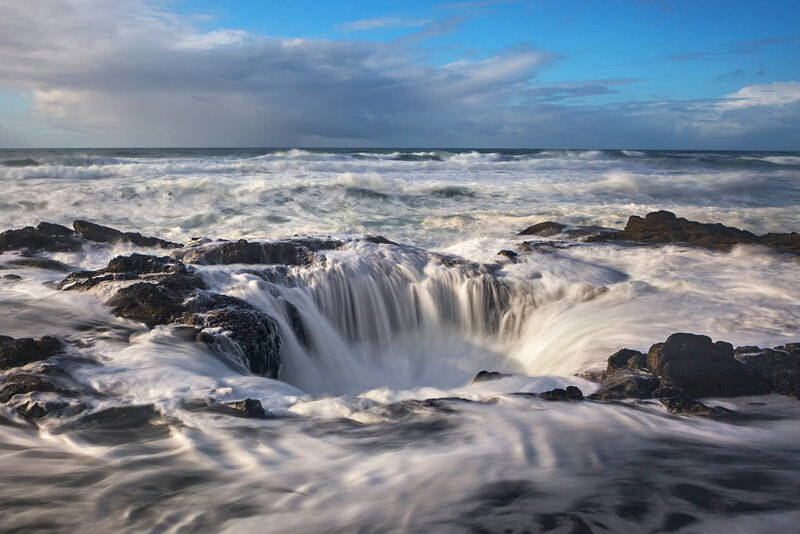 I’d seen amazing photos of a natural feature called Thor’s Well – a hole in the coastal rocks that the surf cascades into when the tide is high – and I wanted to capture it. 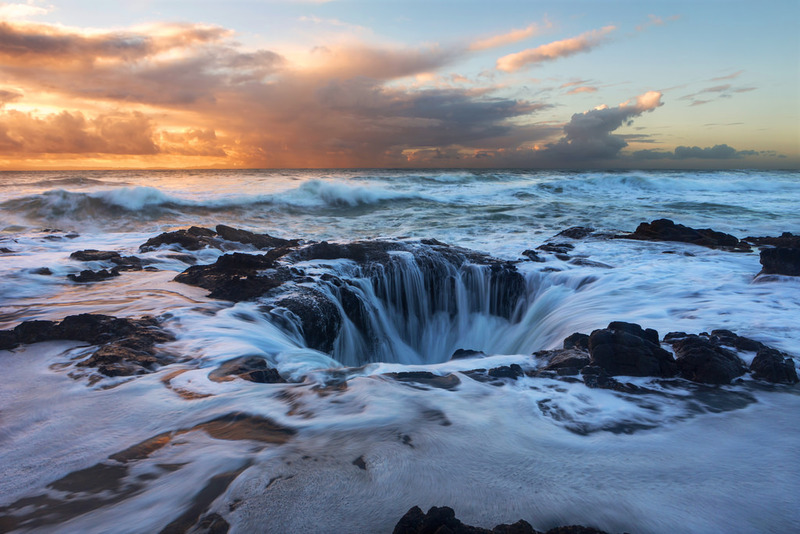 Locating Thor’s Well wasn’t quite as easy as I expected, but I eventually found the right pullover on Cape Perpetua, a few miles south of the tiny town of Yachats. What a cool area. A relatively flat plateau of rocks spills out into the ocean, surrounded by whitewater on three sides. 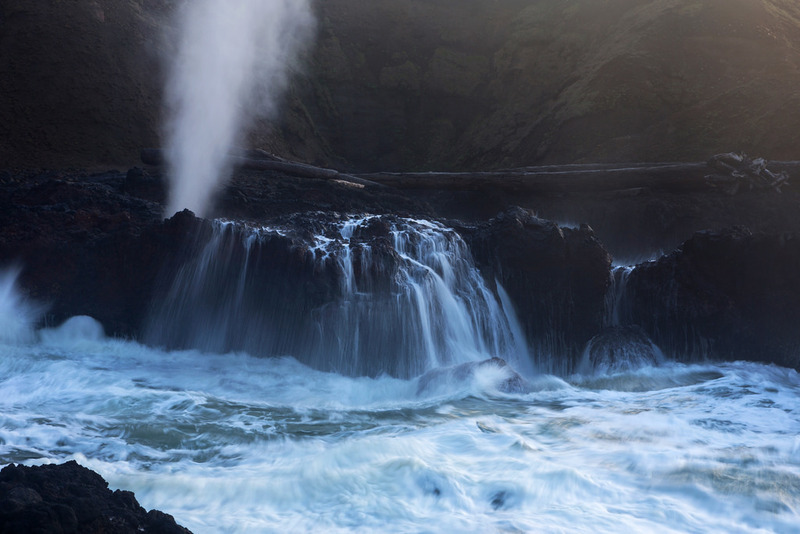 The waves running up Cook’s Chasm to the south are occasionally strong enough to shoot up a plume of seawater called the Spouting Horn. 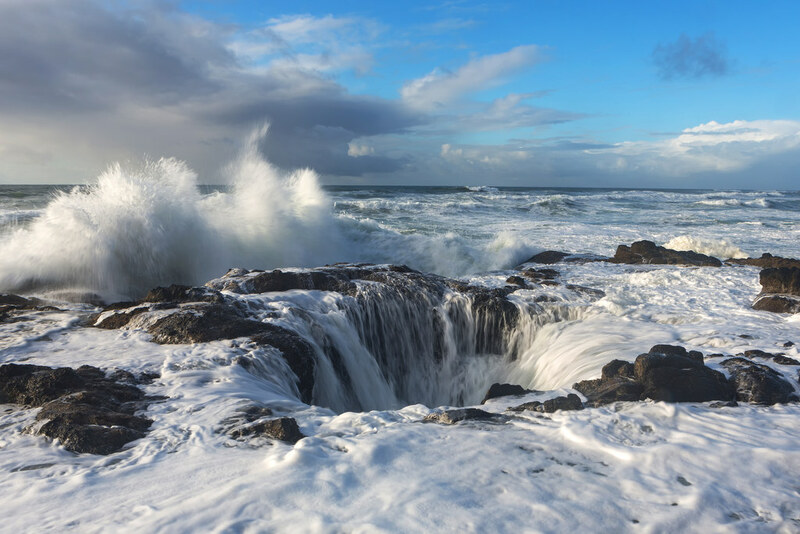 And on the far western edge of the rocks, directly in front of me, was Thor’s Well. I made my way out to a narrow line of slightly elevated rocks near the well and tried to figure out how I could get the photos I wanted without soaking my camera or being dragged out to sea myself. The waves mostly seemed to be breaking short of my position, but every now and then the surf splashed my legs. I felt secure enough to take out my camera and set up my tripod. I’d only taken a few shots when a large wave hit the rocks and sprayed far beyond the well. Someone might as well have dumped a bucket of seawater over my head. My camera is weather-sealed but not waterproof, which meant that letting it get soaked was definitely bad work. Having learned my lesson, I wrapped my camera in a plastic sleeve and then wrapped myself in a waterproof jacket – two things I should have done in the first place. 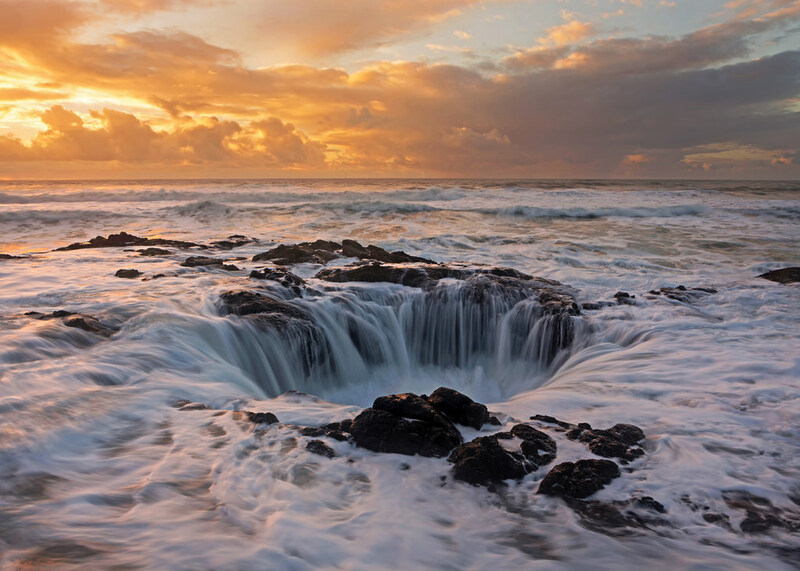 I spent hours experimenting with different ways of shooting Thor’s Well. My initially soaking turned out to be the worst one, but every now and then a particularly powerful wave would crash over my legs and cause me to question my judgment for standing so close to the edge. I wasn’t sure if I was more worried that my camera would get drenched again or that I’d be pulled down into the well. The phrase “Never turn your back on the ocean” kept running through my head. Still wet and starting to shiver, I began thinking of my warm car. But there was no way I could leave before sunset. The clouds looked promising and finally did catch some nice color before the light faded entirely from the sky. Happy, cold, and tired, I walked back up to my car, turned up the heater, and drove on to Newport for the night.